This is the third in our series of Microsoft Office application tips and I’ve got 9 beginner Excel Tips for you in video form. I’m classifying these as beginner tips. They are tasks that a typical Excel user would probably do on a daily basis when using spreadsheets. Things like resizing columns, inserting rows or columns and basic formulas. Here’s the list of 9 tips I cover in this video. Excel is probably my favorite of all the Microsoft Office products. I use it more than the others. Like all Microsoft applications, it is very powerful. Even though it can be intimidating, there are so many resources to help you out. For example, if you use Excel 2016 or 2013, when you first start it up, you see the backstage view where there are a multitude of templates to make just about any kind of job you have easier to do. Charts – who doesn’t love all the newest charting function! To change the ink color and stroke width, point to the color and width (0.35mm – 0.5mm) you want. On the File menu, select Options. In the box on the right side of the dialog box, tap the check box labeled Draw.The Draw tab remains visible on the ribbon in this app until you return to this dialog box and turn off this option. 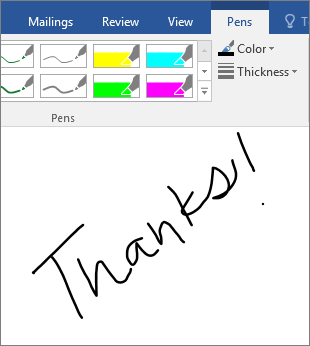 The new pen set (available to Office Insiders) is customizable and portable. 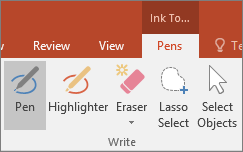 You define the pens you want to have, and they are then available in Word, Excel, and PowerPoint. On the Draw tab of the Ribbon, tap a pen or highlighter to select it.